Want to make a flower bouquet for someone special in your child's life? 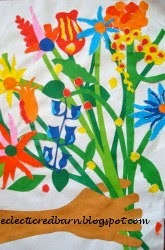 Your youngster will love ripping up or cutting out colorful sheets of paper to make his very own floral bouquet. What a great gift for Mother's day or for a special grandma. These flower collages will remain beautiful for years to come! They say if you are given lemons - make lemonade. 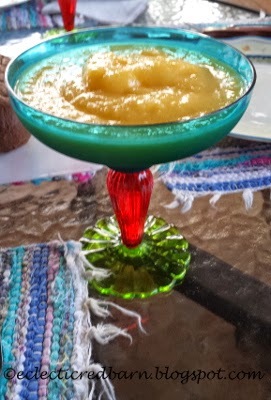 What if you have tons of mangoes - make mangoladas! Spring time is in the air. The weather is getting warmer; flowers are poking their heads up out of the soil and trees are blooming. Here in Florida, we too experience these changes, although not as noticeable as up north. As the weather changes, the birds begin to make their way back up north. We had a wonderful experience of this today. My daughter and her best friend came for Easter and are enjoying the weather. We were out on the deck and her friend said "you have ducks swimming in your pool". How cute! I said, "no we don't". Awhile back I found this mirror at a garage sale with these other items.Wasn't sure what I was going to do with it, but for only $1, I would find something. How about a message board? 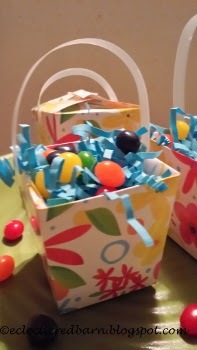 I wanted to make some little Easter baskets to place on the table for the kids. I had already made Crocheted Candle Holder favors for the adults. If you missed that post, you can see it here. I found these mini Chinese take-out boxes at the Dollar Store and thought they would be perfect. They were so colorful and spring like. Who says the birds don't like their feed in fancy cups? Well maybe they don't, but I like to hang something fancy for them to eat from. I love to pick up cheap cups and saucers and when I found this one, I decided to make a bird feeder out of it. Wait, that is not a bird feeder, where is the seed?